How much do we, as a culture, love swapping gross stories? A lot. Whether it’s human nature or a fascination with the icky, we’ve got one we know you need to hear. This story is about a friend of a friend who shall remain nameless. Out of nowhere, he couldn’t hear—and the problem lasted for days. The cause: a buildup of earwax. We’ll spare you the gory details—although we suspect you might secretly want them—but the only way this person could restore auditory function did not involve cotton swabs. In fact, this everyday item might have exacerbated the problem in the first place. 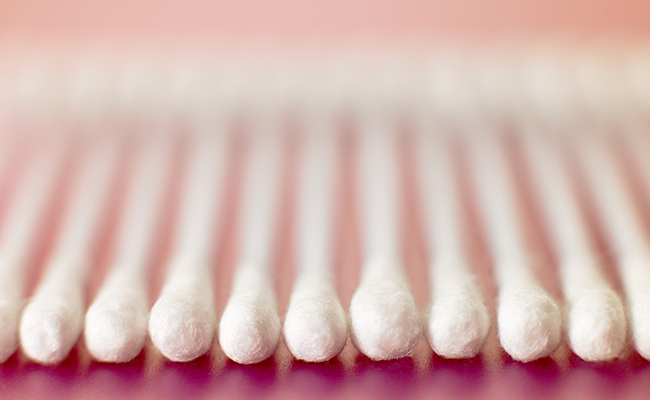 Let’s be real—there’s something sort of gratifying about cleaning out our ears with cotton swabs. It’s like the ears’ version of a sneeze. But ears are actually designed to be self-cleaning. So when we employ cotton swabs to do this job for them, it disrupts the skin’s natural shedding process, and potentially pushes wax further into the ear canal, where it might accumulate and turn into a blockage that can lead to hearing loss. Ear wax is comprised of cerumen, a waxy substance produced by sebaceous glands in the ear to keep the skin there moist and to trap dirt particles and bacteria. Dead skin cells also get mixed in. So yeah, this stuff is meant to exit the ear canal in order to keep the cavity clean. But as tempting as it is to try and swipe it up with a swab, resist! Allow your ears to naturally cleanse themselves—chewing and other jaw motions actually help to work it out of there to the outer ear canal, where it dries, flakes, and falls out. But if even that grosses you out, use a washcloth to gently wipe the outer ear canal. For added maintenance, there are a couple of safe and effective tricks that can help prevent wax buildup in the ear canal. One in particular is the remedy that worked for the poor guy in our earlier anecdote. Once a month, put one to two drops of hydrogen peroxide into your ears and leave in for 10 minutes. Then, hop in a hot shower. The wax will liquefy and easily rinse out. Keeping the skin in ears moisturized can also help minimize dead skin cells that could contribute to a buildup. Adding a drop of mineral oil into each ear daily is a safe option for regular upkeep. Aside from cotton swabbing, what else shouldn’t you do? Definitely don’t do ear candling. If you don’t know what that is, we won’t elucidate, because doing it can burn your ear drums. The FDA is not a fan. Also, using water to clean out the ears could be hazardous as well, potentially causing earwax to swell up like cooked rice or pasta. Don’t do it! If you’ve ever had ear surgery or a hole in your eardrum, go to a physician to have earwax buildup professionally removed. So there’s the final answer on earwax. An added bonus to ditching cotton swabs: You’ll cut down on waste. And hopefully, your ears will work like a dream. Just don't jam it down your ear canal. Works great for the outer ear ~ and feels soooo good! Sometimes I just have to swab! But thanks for the peroxide idea, which I will try the next time I have access to a shower. I don' do it often but sometimes whew I just need to. I just don't do deep. My son had an aweful bunch of wax in his ears back when he was about 10. He had to have the doctor irrigate both his ears with saline from a syringe. It was TERRIBLE! He said it hurt so bad from the pressure of the squirting saline solution in his ear and they were REALLY plugged up! Q-tips would have never gotten that crap out! Be careful. The wax can dry up and puncture the eardrum! It gets sharp when it gets dried up! !